Governments involved in conflict are often concerned with how their actions are perceived by the international community. This column uses evidence on the Israel-Palestine conflict and US news reporting between 2000 and 2011 to show how media considerations can impact military strategy. Israeli attacks are more likely to be carried out one day before the US news is expected to be dominated by important political or sport events. There is no evidence of a similar pattern to Palestinian attacks. The findings suggest that strategic behaviour could undermine the effectiveness of the mass media as a watchdog, and thus reduce citizens’ ability to keep public officials accountable. The mass media plays a crucial role in today’s conflicts. The media can be used to fuel conflict and incite violence. A particularly tragic example of this is the genocide in Rwanda, where Hutu-controlled radio RTLM persuaded over 50,000 individuals to participate in mass killings against the Tutsi minority (Yanagizawa-Drott 2014). Governments also use propaganda on state-controlled media to gain public support for their military campaigns, and to boost popularity by praising their (alleged) military successes. Russia’s interventions in Ukraine and Syria and the celebrative coverage of these campaigns on Russian media are a forceful illustration of this. Governments involved in conflict often also care about how the conflict is perceived by the international community, and want to avoid being portrayed as violent aggressors. The international media are generally harder to capture than domestic media. So, what can conflict actors do to minimise the negative impact of military actions on their image abroad? One possible strategy is to time attacks to moments when the attention of the international media is focused on other important events that would crowd out news coverage of the conflict. Are concerns about media coverage and PR considerations important enough to influence military strategy? In a recent paper, we investigate this issue in the context of the Israeli-Palestinian conflict (Durante and Zhuravskaya 2015). In particular, we examine whether the Israeli military and Palestinian militants time their attacks to coincide with other newsworthy events, so as to minimise news coverage of their actions in the US media and the consequent negative impact on US public opinion. Our analysis combines daily data on attacks by either side of the conflict with information on the occurrence of other important events, and on news coverage on US broadcast TV between 2000 and 2011. Specifically, we compile a list of fully exogenous political and sports events, verify which of these events actually dominate US TV news leaving less time to cover other stories, and compare the timing of these events to the timing of attacks. We restrict our attention to fully predictable events because strategic timing decisions can only be based on news that can be predicted. 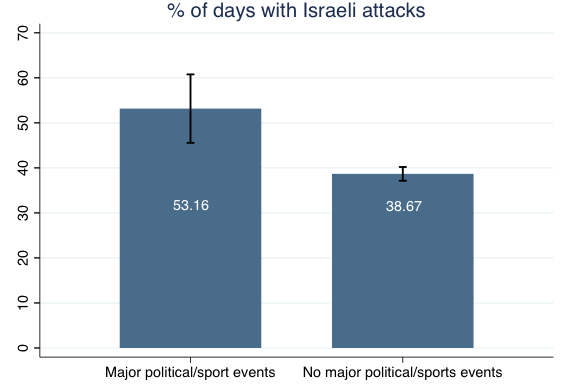 We find that Israeli attacks are more likely to be carried out one day before US news is expected to be dominated by important political and sport events, such as US general elections, presidential primaries and caucuses, or presidential inaugurations. In particular, as illustrated in Figure 1, the probability of an Israeli attack against Palestinians rises to 53.2% on the day before the important events from a baseline of 38.7% on other days. 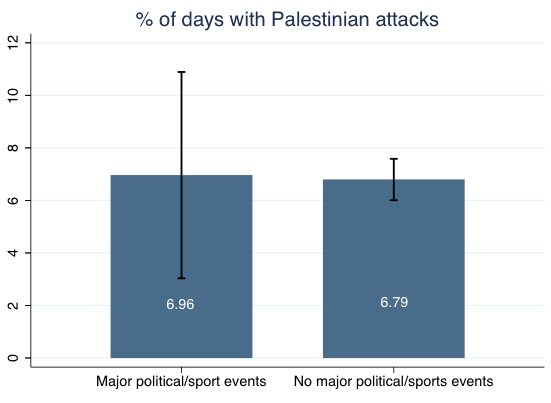 Israeli attacks preceding major political and sport events are also more deadly – resulting, on average, in 1.51 times more victims per day than attacks on other days. We find no evidence of strategic timing for Palestinian attacks, which are as likely to occur around important events than on other days. In addition to looking at specific newsworthy events, we also construct another, more continuous measure of the extent to which US news is dominated by other important events. For each day, we compute the length of the top three news stories – not related to either Israel or Palestine – that were featured in the evening editions of the three main US TV networks (ABC, CBS, and NBC). As pointed out by Eisensee and Stromberg (2007), since the total length of newscasts on these networks is fixed, the presence of important stories leaves less time to cover other events, including the Israeli-Palestinian conflict, and due to networks’ competition for audience, editors air more important stories first and devote more time to them. Using this measure, we find that Israeli attacks are more frequent and more deadly when more time is devoted to the top three non-conflict-related stories on the following day. Again, we find no evidence that the timing of Palestinian attacks is related to the US news cycle. Since some military operations are more costly to postpone than others, one would expect attacks that are more costly to postpone to be less subject to strategic timing. This is precisely what we find – the timing of special targeted-killing operations, which are considered as extremely urgent by IDF, is not related to the US news cycle. In addition, if strategic timing is motivated by PR considerations, it should apply to military operations that are likely to generate negative publicity. As negative publicity is mainly associated with media coverage of civilian casualties, one would expect attacks that are more likely to result in casualties to coincide with other important events. In line with this argument, we find that this is the case for Israeli operations involving the use of heavy weapons, but not for operations with light weaponry. Israeli attacks get covered in the US media both on the day of the attack and on the following day. Why, then, should Israeli forces time their attacks to news expected on the following day rather than news on the same day? 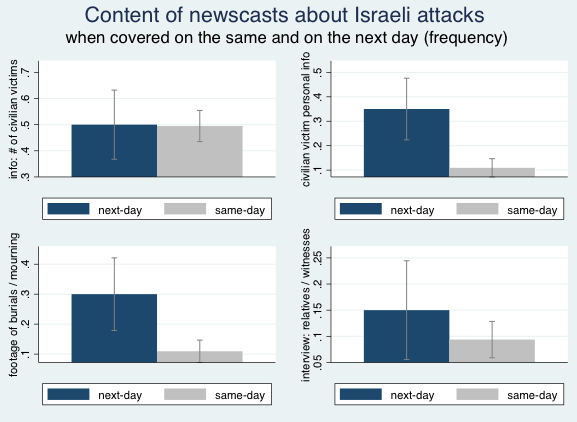 To answer this question, we analyse the content of conflict-related news broadcasts and find that the type of coverage of Israeli attacks differs substantially between same-day and next-day reports. While same-day and next-day news stories are equally likely to include information on the number of victims, news stories that appear on the day after the attack are much more likely to present personal stories of civilian victims and include interviews with victims’ relatives or friends. Furthermore, next-day coverage is significantly more likely to include emotionally charged visuals of burial processions and scenes of mourning. Anecdotal evidence suggests that it is both easier and safer for a foreign journalist to get details of the story on the next day, and that next-day events provide a valuable opportunity to produce emotionally charged content. Overall, policymakers’ strategic behaviour may undermine the effectiveness of the mass media as a watchdog, thus reducing citizens’ ability to keep public officials accountable. Studying the institutional and political causes of such behaviour is therefore crucial to understanding how political accountability can be fostered. Sparrow, A (2001), “Sept 11: 'a good day to bury bad news'”, The Telegraph, 10 October. A vast literature in cognitive and social psychology has documented that both the type of content (statistics vs. personal stories) and the form in which it is presented (narrative vs. visual) are crucial in determining viewers’ experience and the effect of the message. Examples of relevant references in this respect are Borgida et al. 1977 and Houghton et al. 1987. This expression refers to a notorious statement by former UK Labour Party's spin doctor, Jo Moore, who, in a leaked memo sent to her superiors on the afternoon of 9/11, said that was “a very good day to get out anything we want to bury.” See Sparrow 2001, Wintour 2001.